Frozen shoulder after stroke can be a painful condition that hinders your quality of life. We won’t use any crazy clinical terms, and we won’t bore you to death either. We’ll keep everything plain and simple. Let’s get started. What Causes Frozen Shoulder After Stroke? When the arm is affected by stroke, it can become stiffened by spasticity. When spasticity prevents your arm muscles from supporting your arm, problems may develop. First, the shoulder may become partially dislocated in a condition known as shoulder subluxation after stroke. With the upper arm partially out of it’s socket, gravity continues to pull and stress the join. This condition is often painful, but can be treated with the methods presented in this article. Rehab exercise is the best treatment for frozen shoulder after stroke. Because in order to get rid of spasticity in your arm, you need to reconnect your mind to muscle with repetitive practice. This simply means that using your arm will help you improve your arm. This happens through neuroplasticity, where your brain rewires itself based on what you do over and over. The more you practice arm and shoulder rehab exercises, the better your brain will get at controlling your arm. And as your brain regains control of your arm, your spasticity will slowly go away. And as your spasticity goes away, your frozen shoulder will improve. If you want to give yourself a boost, try combining rehab exercise with e-stim. 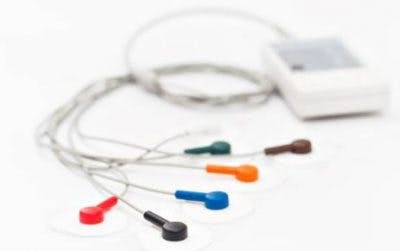 Electrical Stimulation is a great way to reduce spasticity by reconnecting mind to muscle. Your brain controls movement by sending electrical impulses to your muscles. When movement is affected by stroke, it’s because the brain cannot send those signals. By sending electrical stimulation to your muscles, you help retrain your brain how to communicate with your muscles. According to the research, there’s moderate evidence for combining e-stim with physical therapy to treat frozen shoulder. Botox is a great way to reduce spasticity in the short-term. It’s an effective compensation technique. So why are we mentioning it down here with the long-term treatments? Because there’s strong evidence for treating frozen shoulder by combining Botox with physical therapy. So if you want to really jumpstart your results, try using Botox to temporarily reduce the spasticity in your arm. Then, use the temporary boost in mobility to get lots of gentle, repetitive exercise in with your arm and shoulder. This joint approach is the best way to treat frozen shoulder after stroke. 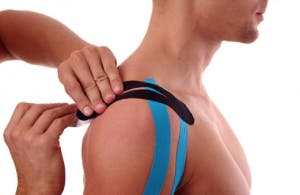 If your shoulder is in pain from frozen shoulder, then shoulder taping could help. While this doesn’t treat the root cause, it can help alleviate pain while you work on rehabilitation. During shoulder taping, a special tape is used to hold your arm in place. 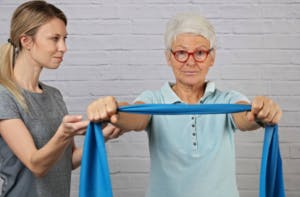 A therapist’s guidance is essential for learning how to properly tape your shoulder (or train your caregiver how to do it). If your arm is completely flaccid (i.e. there is no movement at all), then a shoulder sling could help reduce pain and prevent shoulder subluxation. Warning: When you don’t use your arm, you’ll lose your arm. So if you use a sling, remember to be diligent about gently exercising your arm regularly. Otherwise it will become very difficult to regain use of your arm later. Which Frozen Shoulder Treatment Is Right for You? If you suffer from frozen shoulder after stroke, it’s important to talk with your therapist about treatment. Therapists can show you how to tape your arm properly, apply e-stim correctly, and exercise your shoulder safely. We also have lots of free resources for you to help supplement your therapist’s advice. Try starting with these shoulder rehab exercises and reading up on this guide to treating spasticity for good. Your recovery is in your hands, so empower yourself with as much information as you can. Older Hyperbaric Oxygen Therapy for Stroke Patients: How Does It Work?